Manchester United manager Jose Mourinho has said finishing second behind Manchester City last season feels like one of his “biggest achievements” as a manager in football after the criticism he has received. Speaking at his press conference ahead of the Premier League opener between Manchester United and Leicester on Friday, Mourinho was in a defensive mood about the criticism his United team got for finishing behind a massive 19 points behind Pep Guardiola’s record-breaking City side. And his next comment has already led to backlash from Manchester United fans on social media after Mourinho said finishing behind City wasn’t such a bad thing…. A new season begins tomorrow with Manchester United looking to catch up to neighbours City. 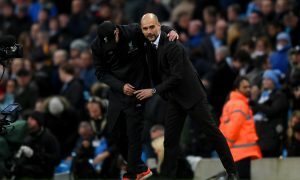 The Reds have failed to finish above City in any season since Sir Alex Ferguson’s last in charge, through the David Moyes, Louis Van Gaal and, now, Jose Mourinho eras.